After 13 years of animating nine shows and 90 hours of cartoons, Collideascope Digital Productions is closing its doors. One Halifax summer, two guys sat across from each other at the Economy Shoe Shop and decided to start a business. "You do your thing, I do mine," says Michael-Andreas Kuttner, over a beer with his soon-to-be partner, Steven Comeau. "Any conflict, we'll settle with a coin toss." Thirteen years later, they've never tossed a coin. Not even when deciding to shut down Collideascope, the animation studio they began in 1995 that grew to be the biggest on the east coast. The Halifax natives both went to NSCAD in 1989, while Kuttner was doing his Bachelor of Design at NSCAD and Comeau was taking a variety of fine arts classes. In 1993, they started a company with another guy, called 123 media design, creating graphic designs and websites for clients. 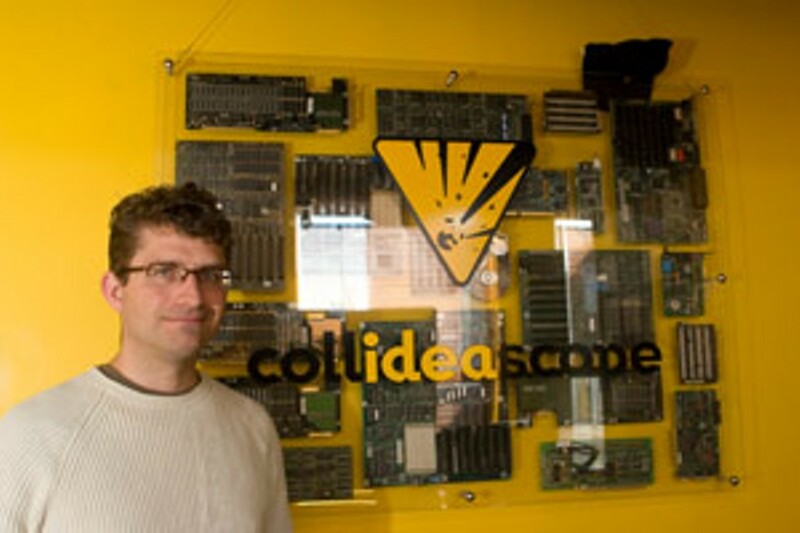 Kuttner and Comeau, self-described computer geeks, wanted to focus on interactive entertainment and television and decided to start Collideascope on their own. In 1995, they figured out how to use Flash software---mostly used for the internet at the time---to animate TV shows. They're known in the biz as being one of first animation studios in the world to use the technique, and animated their first original series, Olliver's Adventures, using Flash in 2000. It ran on Teletoon for seven years and won them a Gemini award in 2001 and two nominations in 2003. They became the largest 2D animation studio in Halifax and were usually working on two shows at a time from broadcasters like Nickelodeon, Kids WB, Teletoon and YTV. They could do all aspects of production, from hiring actors and recording their voices to animating an entire series. At their peak in 2005, Collideascope was employing 130 animators, and in 2007, employed 120. Ron Doucet, a supervisor who worked at Collideascope for just under nine years, says the animation industry goes through cycles, depending on which country can provide the cheapest work for American broadcasters. For the past seven years, Canadian studios have gotten the work because they use Flash technology, which requires half the staff as the hand-drawn method, in a more cost-effective way than US studios. This year, American broadcasters have started hiring out to studios in Singapore, who caught up with Flash technology and do the work for cheaper. Though Doucet says the Canadian animation industry will bounce back in a couple years as technology advances, large studios like Collideascope are stuck without contracts and lots of employees. "There's no need for anything quite our size," says Kuttner, who explains they would have to downsize to work on parts of a show or grow to include other aspects, such as distribution, to survive. In August, after finishing work on Speed Racer: The Next Generation, currently airing on Nickelodeon, Doucet told the team of 30 animators the studio would be shutting down at the end of September. "Steve and I didn't want to change the company after 13 years," says Kuttner. "Better to call it a day and enjoy the fact we had a great time." Between producing nine shows, 90 hours of cartoons and employing around 400 animators from all over Canada, the studio with bright purple and yellow walls found time for fun. Taped to the windows of their Barrington and Sackville offices are pictures of the staff facing the street, from the time when Doucet figured out how to enlarge images by 400 percent on the photocopier. "We're a bunch of pranksters," he says, recalling arm wrestles turned WWF-style tournaments and another supervisor running around the building in a thong after losing a bet. "We weren't your typical button-up company," says Kuttner, the Mickey Mouse-shirted, Converse-wearing COO who threw beer and pizza parties for the staff every second Friday. "It would've driven me stark-raving mad if we had been." A couple months ago, Comeau left for Toronto to open a musical production studio, which leaves Kuttner to shut down the company. But he's confident---they aren't bankrupt, everyone got paid, and all that's left to do is find a home for 120 computers and throw one last party for everyone who worked for and supported them over the years. "It's coming at the right time," he says. "We've built something amazing and helped the animation industry in Canada. Pretty cool for a couple of guys from Halifax."